A residence of particular interest is that of Ezra Carr, LL. D., a tract on the corner of Orange Grove Avenue and Colorado Street, reaching down as a vine and walnut grove into the heart of the city. Eleven years ago this was a barley field, and to-day it would pass for an estate half a century old. Dr. and Mrs. Carr are especially interested in botany, and their grounds contain choice plants and trees from almost every land under the sun. No better place could be selected to observe the possibilities of plants in Southern California. On the estate we find almost all the conifers available in this country growing side by side with the banana, pomegranate, guava, palm, and papyrus. A running list of the plants of this place alone would give, — grapes — forty or fifty varieties, European and American — oranges, lemons, andlimes of all kinds, citron, apple, crab-apple, apricot,barberries (hedge), cherry, currants, figs, guava, jujube,loquat, pomegranates, prunes, plums, pears, peaches, persimmons, mulberries, English walnuts, Preparturien walnuts, almonds, butternuts, beechnuts, chestnuts (native and Italian), hickory nuts, pecan nuts, filberts. These are represented by almost every variety known. Among the trees we notice the cork, india-rubber, cedar of Lebanon, deodar, annearias, yew, varieties of elm, maples, hawthorn, eucalyptus, and acacias from Australia, also palms and pines of nearly all kinds. In twelve years eucalyptus trees attain a height of a hundred feet, and other species in proportion. This estate contains the finest collection of plants to be found in Southern California. I wonder if any permies in Pasadena could find out? Does anyone know if Carmelita Gardens is an apartment complex or actually gardens? Norton Simon Museum says...The Norton Simon Museum Sculpture Garden is a delight for visitors of all ages. Its lush pond—decorated by several varieties of water lilies—stately trees, colorful shrubs and flowers and meandering paths provide a stunning setting for some of the Museum’s most important sculpture. The Garden Café, outdoor concerts, plein air drawing classes and family art-making activities make it one of the liveliest areas on the Museum campus. The history of the garden extends long before the Museum opened in the 1960s. In fact, this area of Southern California was first inhabited by the Hahamongna (Tongva) tribe of Native Americans, then later was part of the Mission San Gabriel Arcángel. Following several owners, the tract on which the Museum now sits was purchased by the Carr family of Wisconsin in 1877. Matriarch Jeanne Carr transformed the property into a lush and verdant estate that she named “Carmelita” and was known as the most spectacular garden in the area. Having passed through several owners, the land was deeded to the city of Pasadena in 1941, with a proviso that part be preserved for the local art institute, later to become the Pasadena Art Museum (and finally the Norton Simon Museum). 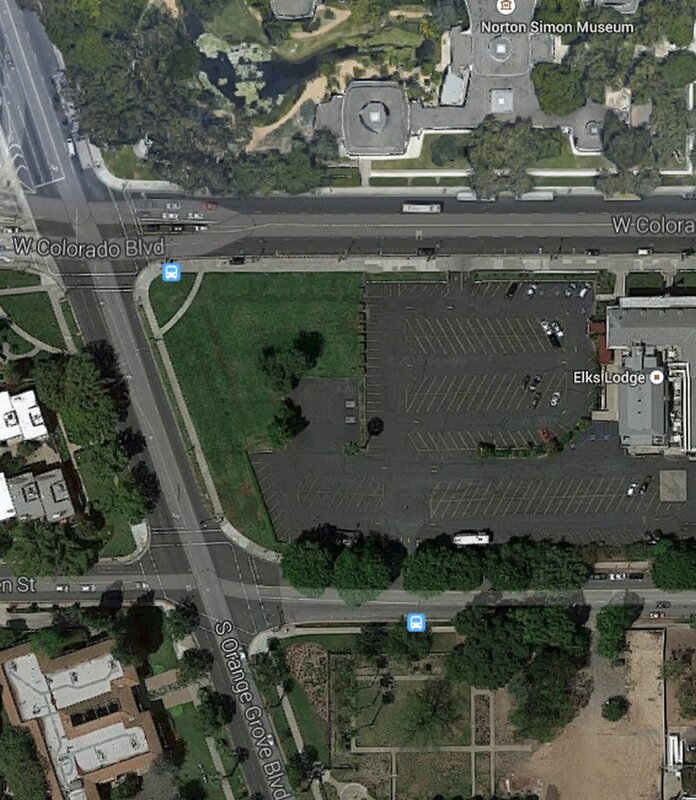 In the late 1960s, the Pasadena Art Museum, designed by local firm Ladd & Kelsey, was opened. Its sculpture garden reflected the sparse, minimalist style of the era—acres of turf, a handful of trees, and a long, rectilinear reflecting pool. I''d like to go do some plein air painting and see if there are any food trees left. It doesn't sound like it, but maybe there are some surprises! Awesome detective work! But sadly, it sounds like the property got bulldozed flat and planted in grass (and sculptures) when they built the museum. That would not be fun. The Carmelita property was eventually subdividedand sold, ﬁrst to Simeon Reed in 1892. The site was further subdivided over the following years and by the 1920s only about 9.5 acres of the original property remained. Throughout the Depression the site was tended by volunteers as a public park, Carmelita Park, and a museum was founded on the site as the Pasadena Art Institute in 1924. In 1941, the land andhouse were given to the City of Pasadena with the stipulation that it should permanently house an art museum. Would be cool to think a garden I planted would be so revered as to remain in the public's heart until it was turned into an Art Institute years later. It's something to think about in terms of those other forms of capital, etc. The history of the Carmelita gardens and estate has been all but submerged in the development of Pasadena in general, and the Norton Simon in particular. The rich history of the site could have been drawn upon more in creating the Norton Simon gardens, both in its ﬁrst iteration as a modern garden, and in its recent redesign. Future plans for the garden might consider drawing from the historic records of the Carmelita estate and reintroducing plantings that reﬂect the heritage of the horticultural tradition that emanated from the Carrs, and identifying any existing historic plantings that have survived in order to protect them from further decay. The form of the museum gardens currently serves the community and museum users well, but bringing in the historic element has the potential to draw out the cultural signiﬁcance of the Norton Simon in ways that have not yet been achieved. In the quest for efficiency and functionality, I hope we can all preserve and create real beauty with our projects. Beauty matters. It's way immodest to say so, but I have a dream for my farm that ends up with a similar, sustaining nonprofit organization after my death. 20 acres, previously farmed with tree lines, 36' of elevation change over 1,300 feet of south facing slope, 7,000+ trees planted so far in previously tilled acres at a density of ~500 per acre. Sounds cool to me. Not too brash, although the details aren't out there yet. A lesson here is that it's impossible to see the future, but making an impact today can leave a long legacy of respect and commitment to better things. It's really odd and amazing that a beautiful garden morphed into an art museum. I don't know why, I just like that circumstance. I think it goes without saying that most people wish it were still an amazing food forest / garden. That's what I would prefer anyway. But under the circumstances, this story is a rich one, especially when looking at the long game for our "permanent"culture projects. I went to this library about 15 years ago. I do not recall any food forest type vegetation at the time. This happened allot in S. CA. 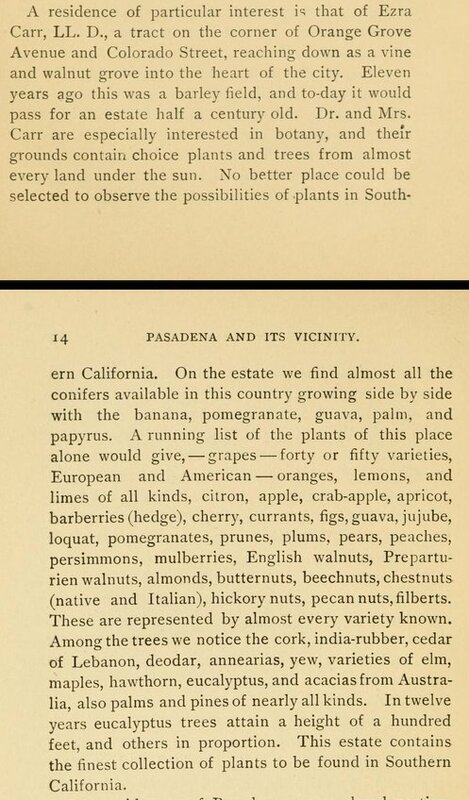 My great-grandfather, grandfather, and family, had a similar food forest in Garden Grove with species from around the world. They were all botanists. My great-aunt even brought in 'pocket monkeys' from S. America who swung in the trees for years until a deep frost hit one year. I have pictures and lots of stories. Unfortunately, when my grandfathers eldest brother retired he sold the property to a man from Japan. You would think that would be a good thing, but the man was odd, he bull-dozed all of it, and put in crushed white rock. It makes me so sick. When my family sold it to him they also subdivided the property and the well paperwork says they found redwood trees at 300 feet. Ah yes, lovely crushed white rock. So radiant in the summer time! dry subtropical Mediterranean climate: Who has one?